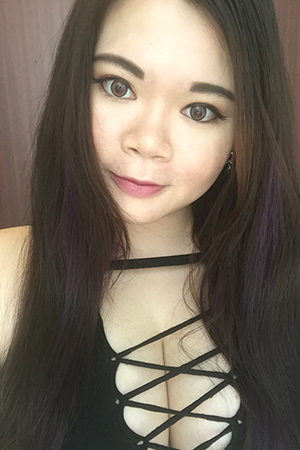 Here’s a really simple look that make use of colored eye liners on days when you’re too lazy to care about blending eyeshadows. Haha. Especially now when eye liners are not just limited to black, browns or khaki colors. There’s a huge variety of colored eye liners available in the market now! Say pastel tones, metallic tones, both liquid and pencil formulations. Adding a pop of color to your eyes is a breeze now with so much choices out there! Here’s a close up look at the colored liner eye look that I’ve been doing very often these days. It’s basically just three lines of liners and a light shimmer eyeshadow to brighten and highlight the lid area. Over here, I used a black liquid liner to line my eyes as per normal. I tend to draw the line slightly thicker. Then I used my Stila liquid liner in Periwinkle which is exclusive to Sephora and draw above the black liner. I overlapped the colored liner slightly over the black liner but I didn’t draw a full line. The colored liner should be just be drawn about three quarters or four fifth of the black liner. Then I just add on a bit of black and join with the colored part near the inner corners. I only winged the black liner a bit but with the colored liner, I winged it more. For the lower lash line, I used my gelpresso liner in Mint from Clio and line just half of the lower lash line. I didn’t line it fully as I do not want it to look too dramatic as it’s for a regular day look. I kept the liners to just under the fold of my eyelid so it’s more subtle. The colors can be seen more clearly only when I blink or look down. I really love this look as it’s really fun and playful. You can mix up different colors combination to get different feel. I’m thinking to get more of the colored liquid liner from Stila as it’s really smudge proof and dries really fast! Plus it’s super easy to draw with the fine brush tip!